Something that I've been looking forward to for the past few months... and it'll be on next week! Can't wait for the next weekend when the STGCC 2012 will happen. I've been to the previous year's event, and I had such an awesome time. Of course, it was quite a blow to my budget with all the exclusive merchandise available! I wasn't able to get the VIP tickets in 2011 as I wasn't fast enough, but this year I've the VIP passes for both days. 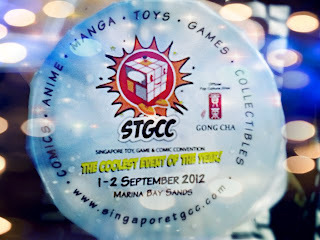 Totally psyched for the STGCC! Can't wait! In the meantime, gotta work hard for the next few days!